All Saints’ Parish in Frederick County has had a continued life of active service since 1742, first as a parish of the Church of England, and after the Revolutionary War, as a unit of the Episcopal Church. Over time, three parish churches have been erected; the first in the original churchyard located on West All Saints St. in Frederick where Francis Scott Key attended services. This edifice was demolished in 1813. 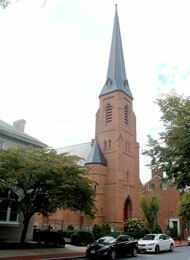 The second church was consecrated on November 12, 1814 and was built on North Court Street, near Court House Square. It was designed by local architect Henry McCleery and was built on land purchased for the parish by Phillip Thomas (son-in-law of John Hanson) and Richard Potts. This building became the parish house in 1855, upon the completion of the third and present church on West Church Street in 1856. It was designed by Richard Upjohn of New York, one of the most famous architects of Gothic Revival Church architecture in America. During the Civil War, the church was used as a hospital for soldiers injured during the Battle of Antietam in 1862. The new All Saints’ Parish Center was completed in 2002, located behind the Black Horse Square Building, on West Patrick Street. In 2017, All Saints’ Episcopal Church will celebrate 275 years of continued service to its attendees and to the local community. These records are published and made available for free by Bob Fout, Genealogist. You may use these records for personal research. You may not repurpose, republish, or otherwise make these records available to others for personal gain without written consent from Bob Fout.